Cream butter and sugars, blending well before adding eggs and vanilla, combine well. Add dry ingredients and combine well. Stir in chocolate chips and peppermint bark. Drop by teaspoonful, two inches apart on prepared baking sheets. Bake for 8-10 minutes, until lightly browned on edges. Cool on wire racks, store in airtight container. Let me first say, humbly, that this year's Cookie Parade has been a huge hit. I am just so touched that so many of our tour merchants, partners, and friends loved the gifts we offered last week, with such joyful passion. Several requests were made for more cookies, please, as in, encore! More than one suggestion was made to have our own cookie shop. Wouldn't that be nice?? All of this hoopla has actually made me quite introspective, and filled with joy, to think about how really, really happy people are to receive cookies. I would just love to share, that whether you ever make any of my recipes or not, just know that the offering the gift of homemade cookies is almost powerful enough to make people (especially doubters) believe that we do in fact live in a kind, loving, and benevolent Universe. I just love being an agent of that. My sisters and I were on the phone to each other yesterday, comparing baking notes from our respective kitchens. Lisa finally got on board which is why that call wasn't made until Dec 20; she has finally come out under from the heaps of work in her office. We anxiously await the first taste of her signature spritz cookies. Suz and I never really wanted that job, I think the spritz cookies have always only been on Lisa's list. Before I get to one recipe which has made a big splash on my own hit list this month, I appreciate your allowing me to reminisce about some of the most special cookies we grew up with. They came from across the street, from our neighbor Mary Mendes. She has since passed away, for many years now but, I know that we can all still remember her special paper plate of homemade cookies that we received every year as a family. The tag always said "from Mary Mendes", as if we might confuse which Mary made the best cookies on Cordova Street. Mary was like the neighborhood grandma. She called all 5 of us, and all the other neighborhood children, her "little chickadees". Right up until the time she passed away, in her 90s, she would still recall how she took care of all of us at one time or another. Her husband died when she was 59, and she learned to drive their classic 1965 mustang with my mom as her instructor. The day she passed her driving test, my father made her a cocktail to celebrate and she giggled with excitement. She was an absolute darling, and this Christmas my thoughts keep returning to her memory. The 'return' of my cookies seem to be having the same impact on my gift recipients, as her cookies had on my family. I am so touched that bakery owners and gourmet chefs and shopkeepers are thrilled beyond measure to receive my homemade cookies, when we all know LA's best products are right at their fingertips 7 days a week. 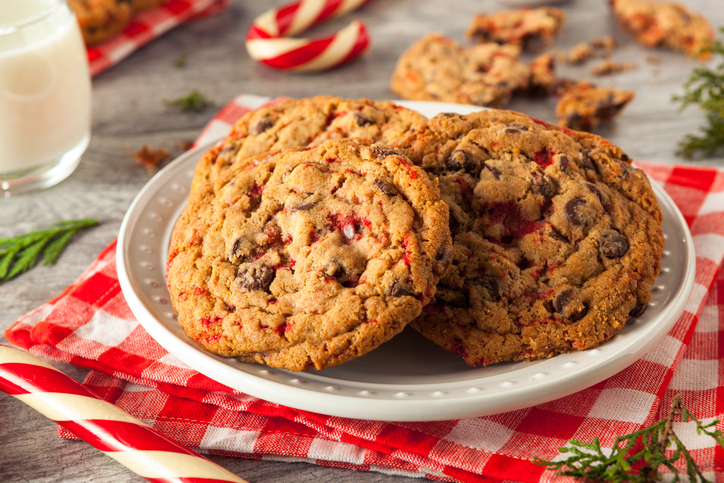 Growing up, we made batch after batch of homemade cookies and, to receive those from "Mary Mendes" was still like receiving a bountiful treasure chest each Christmas. We especially loved that the cookies were usually the same varieties each year. What an incredible gift she offered ... it was like you could taste the love in every bite of her simple, beautifully crafted cookies. I feel like her spirit nudged me this month to add some peppermint to my chocolate chip cookies. Her chocolate chip cookies (the BEST) always seemed to pick up the flavor of something peppermint on the plate. This year, I added a chopped peppermint bark bar from Trader Joe's, (which is made with both white and dark chocolate I believe) to the dough. It makes a fantastic cookie! If you can't find this bar, peppermint bark is seasonally available at many stores, including Cost Plus, Crate&Barrel, Williams-Sonoma, Sur La Table, and maybe even grocery stores right now. My chocolate chip cookie recipe is basically the original Toll House one, the first recipe I ever learned with my mom. I gently recommend using the best vanilla extract you can find, pure butter, and even cage-free or organic eggs to yield the absolute, most delicious cookies. If those high-grade ingredients are not handy, adding a healthy dose of loving feelings while you mix and bake the dough, will suffice. I love listening to my favorite music while I bake. I do everything by hand without an electric mixer so I can focus on how yummy the dough looks. I really think, if you take the time to have all of your senses engaged - sight, sound, touch, smell, taste (the last two can kick in even before baking) - your cookies can't help but be spectacular. Please, try it and let me know! Melting Pot Food Tours is not affiliated in any way with The Melting Pot restaurant chain.